MINT Gym + Nutrition | Allergies – Looking beyond the skin and nose. I am amazed this year at the amount of pollen around. My car is constantly covered in a yellow film and our deck has a carpet of yellow pollen! But it’s not the just the pollen. Do your pets send you into a sneezing frenzy? Or do certain grasses or flowers leave you wanting to scratch your skin off? Or have you noticed that certain foods leave you head achy or with mucous dripping down that back of your throat? If you answered yes to any of the above then you may be familiar with the term ‘A topic’ disease which includes eczema, asthma, rhino conjunctivitis (hayfever) which affects millions of people worldwide. So why does your body react this way? Essentially your body or to be specific your immune system believes that these otherwise harmless substances are threatening. So your body regards these substances as allergens and when detected your immune system releases large amounts of the chemical histamine. Histamine is a like a burly bouncer outside a club; its job is to muscle an allergen out of your body by any means necessary. Some of the ways histamine does this is by producing redness, inflammation, a runny nose, itchy eyes, constricted airways all of which are classic signs of allergic reactions. Allergies are like onions – they have layers. Addressing the root cause of your sensitivity. The Mint Nutrition Clinic is a Functional Medicine Practice. So our approach in helping you with your allergies is to not only help with symptomatic relief of your reactions, but also dig further into why your histamine reaction is happening in the first place and build up your immune system to be able to tolerate “threatening” substances whether it be pet hair, pollen or dust etc. As Functional Medicine Practitioners we will use our years of evidenced based knowledge as well as clinical experience to design a protocol that is suited to you – the individual. We will consider all aspects of your health including looking at clues from your food, stress management and general well being to design a program that will support your needs. We use nutrition as the foundation of any health protocol – understanding which foods you need to rest from or perhaps avoid altogether for optimal health outcomes. Understanding how food can either be our worst enemy or our best health friend is vital for sustainable health outcomes. As Clinical Nutritionist’s we are huge advocates for “Food as Medicine”. There are a number of nutrients and herbs that can help you manage your symptoms of allergy and sensitivity all of which are aimed at supporting and balancing your immune system. We suggest supplements that help to reduce inflammation, control histamine release, as well as support good digestive and immune function. Part of our Functional Medicine approach is to use supplements specific to you – the individual – and your needs/symptoms. Probiotics and bacteria– the life inside of you! The average Western Diet is not optimal for keeping your bacteria in balance and in fact supports poor gut microflora! You need a good balance of beneficial bacteria to keep your immune and digestive system healthy. Finally scientific studies are supporting the therapeutic use of probiotics for a range of different health conditions which is great! With this knowledge we now know that specific strains will give the best results for certain health issues. It is important to get this right as just like a treatment protocol, it is not a one size fits all approach when it comes to taking a probiotic. Yogurts, drinks, lollies and even poor-quality probiotic supplements may not contain the right beneficial bacteria or at the therapeutic dose required to target your individual needs. We have access to Practitioner Only Probiotics which have been thoroughly researched so we can prescribe the right probiotic for managing your specific health needs and strains that are specific for hay fever and atopic conditions such as eczema. Get on top of it now and book and appointment! 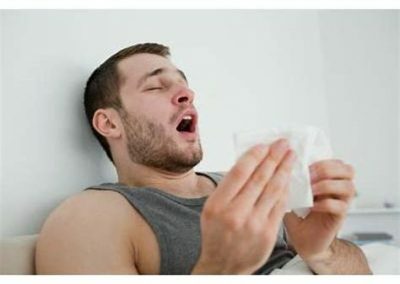 With the sneezy season, don’t wait any longer to get on top of your symptoms, book an appointment so that you can not only manage the symptoms, but long term, reduce (and dare I say it eliminate!) the symptoms so you can enjoy the beautiful spring weather without taking a box of tissues with you or scratching those eyeballs out!